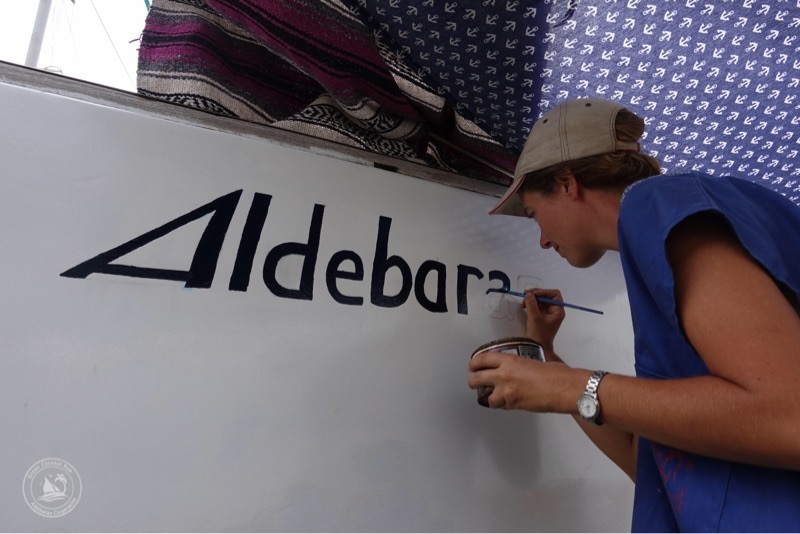 Somehow we got it done… Aldebaran repaired and repainted, ready for launch. 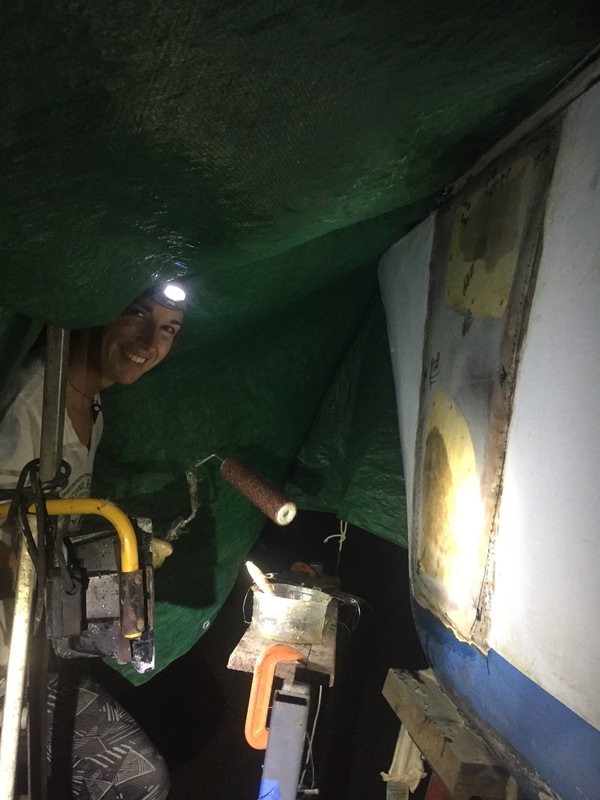 During our stint in the boatyard, Sabrina and I took time a few evenings to recharge our batteries, and help make our two week marathon-sprint of boat repairs a little more bearable. 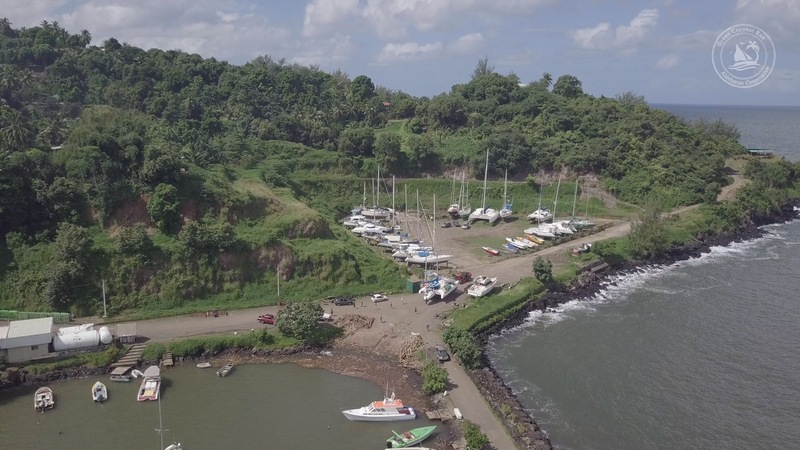 Every Wednesday evening at the “Search and Rescue’s” lookout station, a five minute walk from the boatyard, a BBQ fundraiser is held which lots of cruising sailors attend. Enjoying a $5 can of Hinano beer with a music jam by the open air fire, we met quite a number of young people cruising the high seas. 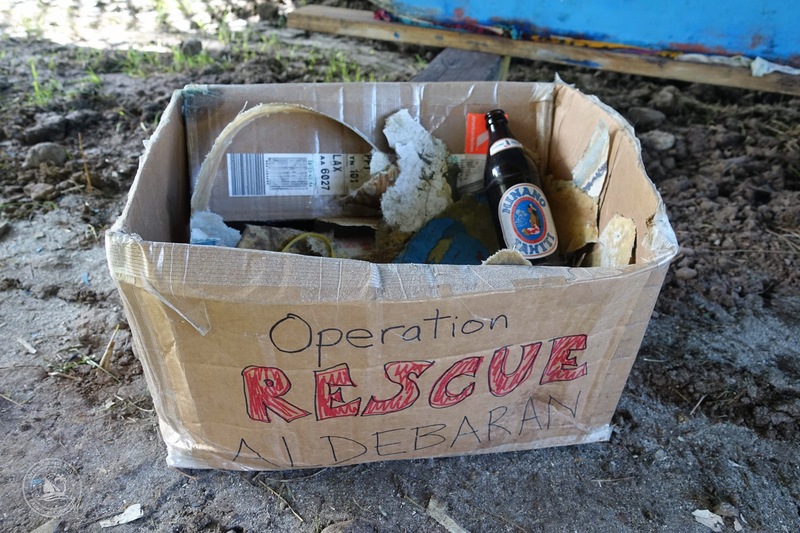 Most of them were “hitchhiking” on boats (via find-a-crew type of websites), serving as crew members to help run night watches across the long Pacific passages. But there was also a surprising number of young sailboat owners (in the 25-45 year old range). This was very different from what we are used to back in Central America, where the overwhelming majority of boats were owned by retirees. 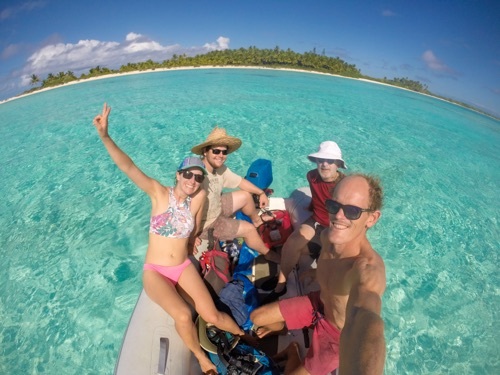 These younger sailors are normally looking for work along the way, or planning to sell their boats as soon as they arrive in New Zealand or Australia, and several also receive contributions from their crew members. The boatyard was as nice a community as we could hope for, and we were often invited to have lunch or dinner with other sailors on their land-locked boats. This helped our morale to carry on the daily toil of sanding fiberglass and filler, which seemed to never end. Our energy level began to waver in the last week of work, and Sabrina and I took turns “crashing”. Our bodies were simply too run down by the intensity of the work. 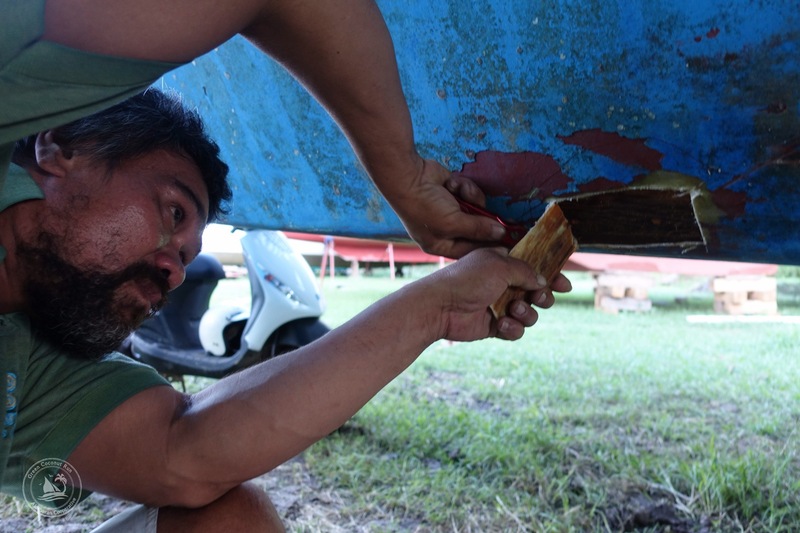 Beyond the dust, heat, and exertion, the worst physical effect of working with the heavy duty fiberglass from the boatyard was the unbearable, itchy rash it left on our skin. We never experienced this problem before with the thin fiberglass we use back home. 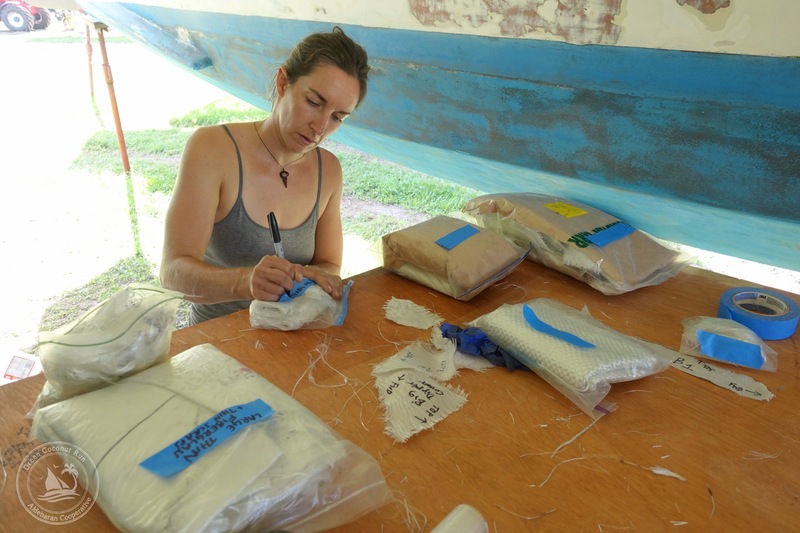 However, the thick fiberglass shards got through all four of the protective suits we had purchased, to the point we could no longer wear them; or for that matter, our long sleeve work clothes that were now also contaminated with fibers. The only saving grace was the cold pressure shower 30 yards from our boat, which we now used obsessively to cool off and wash off the grime. In retrospect, we should have paid the local lady to launder our work clothes (@$20 per load!) but we were so disgusted by the high cost that we forgot about that possibility. My clothes made me itch like a madman, so I ended up working in old boardshorts and running into the shower every two hours to wash off my body. Our departure from California in 2015 was at the tail end of four months of work at the Ventura Boatyard. 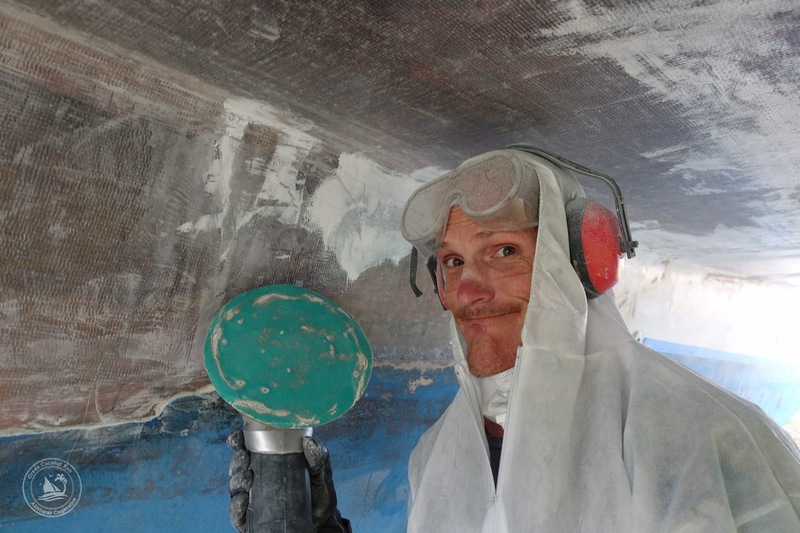 I hoped that in the future we’d never have to do all that grizzly repair work of fiberglass and sanding the boat on our own again. I hoped we’d be able to hire help in affordable countries down the road. 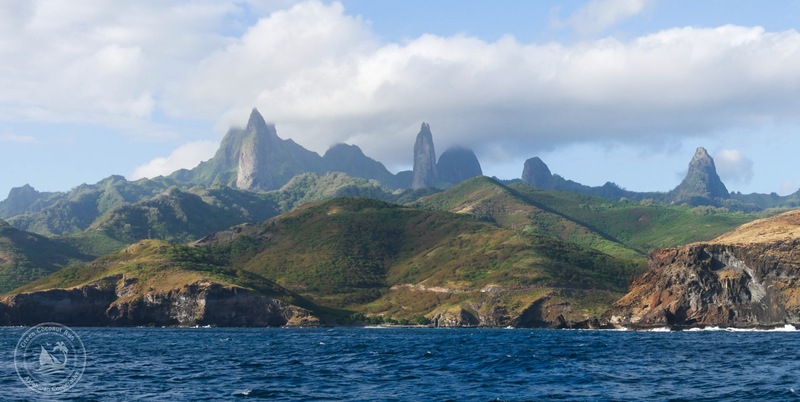 As fortune would have it, we ended up doing a haul out in Marquesas where labor is expensive. The only thing that kept us in overdrive through days 10-14 was that the end was in sight. We frantically worked to make the most of the miraculous sunshine, which we knew could be interrupted by torrential rain any day. 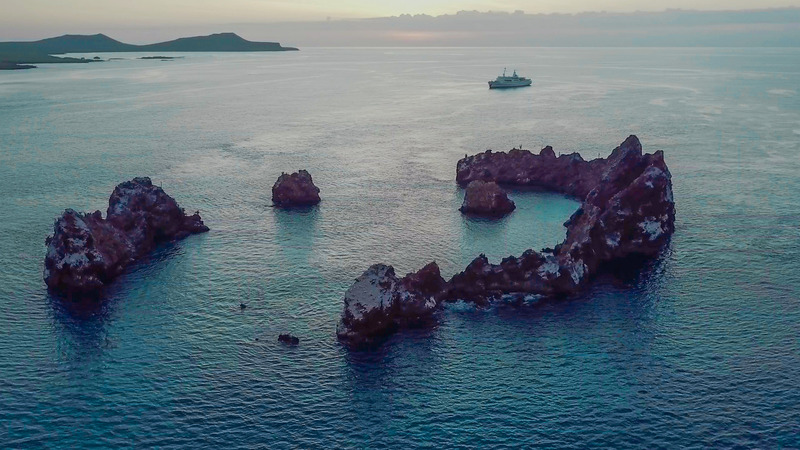 We were determined to finish since our friends were joining us in a few days, and Purgatory would soon be over and Aldebaran would be back where she belongs… in the water. 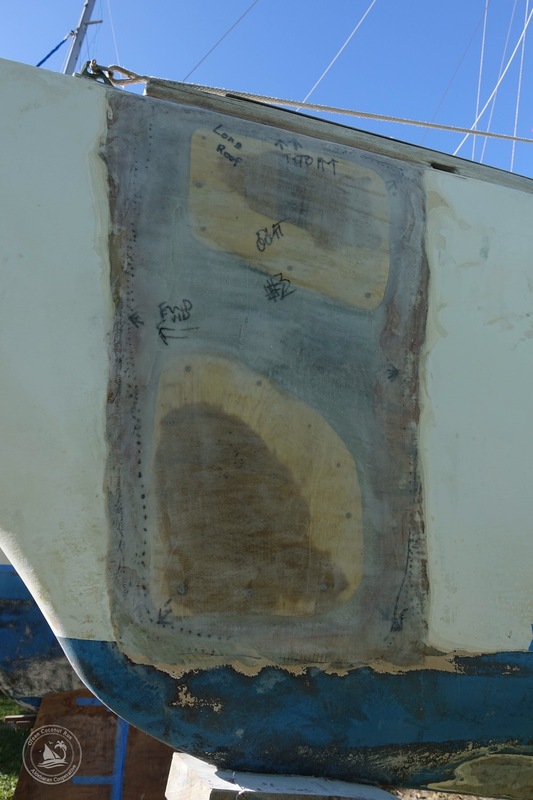 Every time a boat is dry docked, you’ll find little nasty secrets that need repair. I spitefully call them “Gremlins”, because they come out of the dark recesses of the boat and bite you in the back. Sabrina and I cranked away at the first 5 days of work before any Gremlins popped up their ugly faces. “Pray that it is sunny,” I told Sabrina. 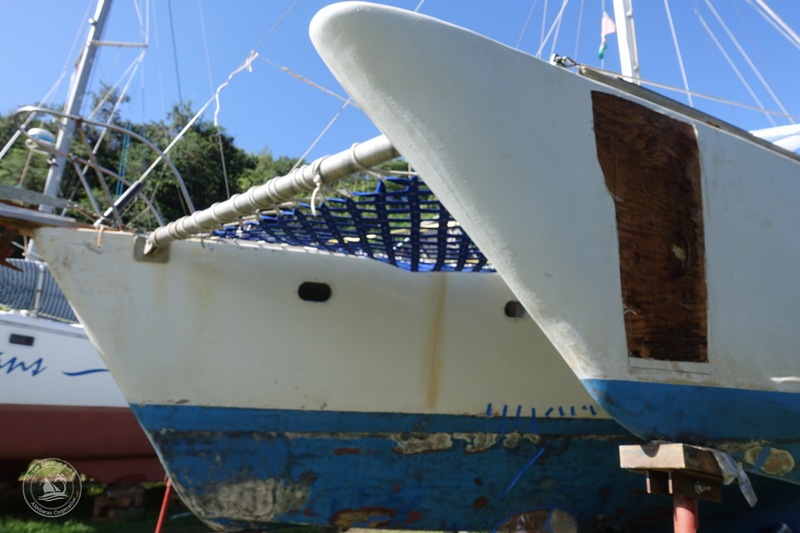 Our repairs need sunshine – so that wood could dry, fiberglass could adhere, and paint could be applied. 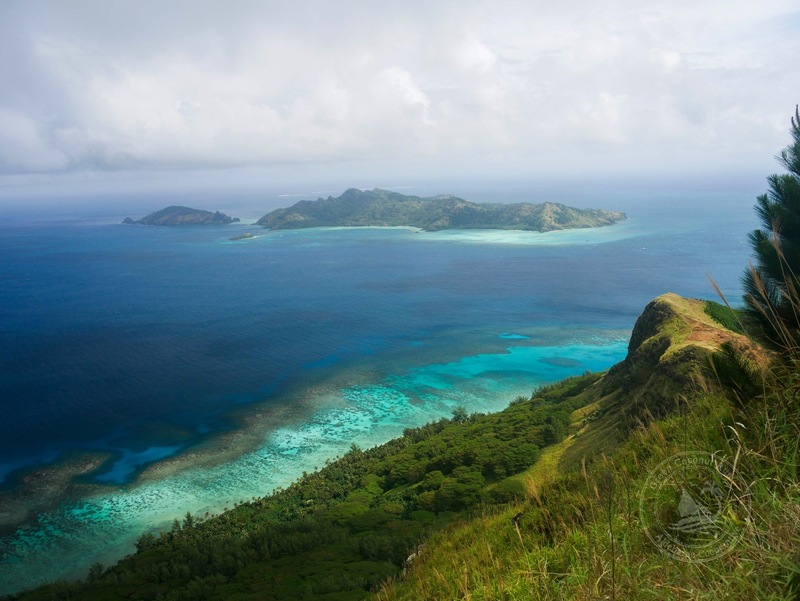 This was a tall order given that the Marquesas had experienced five straight months of the rainiest weather locals have seen. Cruisers we talked to were horrified it was dumping rain non-stop during the supposedly “dry” months of January to May. And now we were in the “wet” months of June-August! 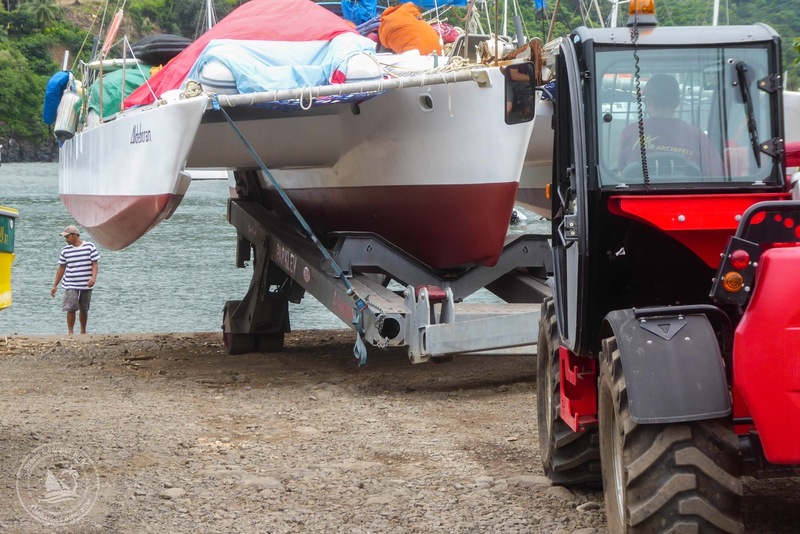 Luckily, the weather flipped a switch and the rain stopped the week we entered the boatyard. This was nothing short of a miracle. 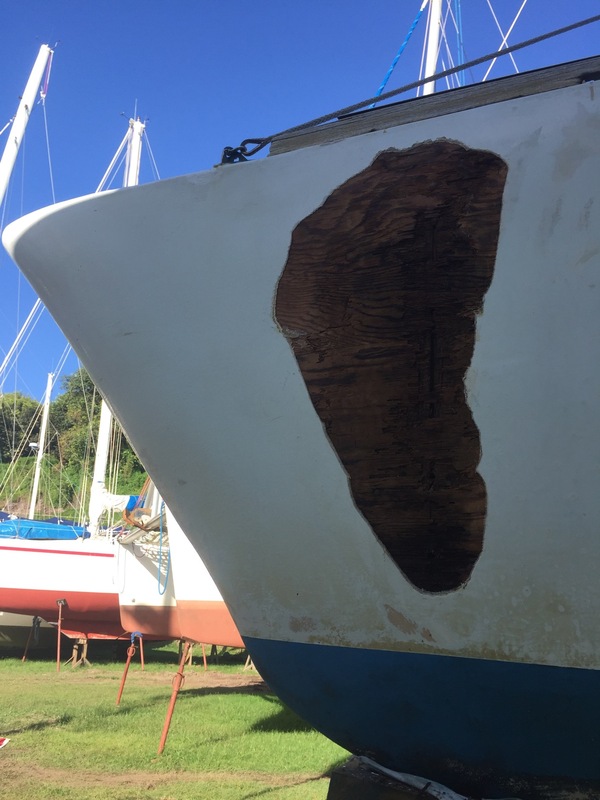 Despite the unprecedented sunshine, the wood on the port ama (the location of the major delamination under the boat’s wing) refused to dry properly. We had been working haaaard, 5am to 9pm everyday, powered on coffee and baguettes, grinding and sanding the whole boat. After several of sunshine, the wood looked dry and ready to glass as planned, until suddenly as if a faucet turned on, the wood looked wet again! What?? How does the dry wood suddenly get wet, without any water getting on it? We scratched our heads. We borrowed a heater to dry the wood, pulled everything out of the ama to dry it out from the inside. Two hours after drying the wood completely, it would start glistening with moisture again. It was driving us crazy! Enter Armindo, a.k.a. 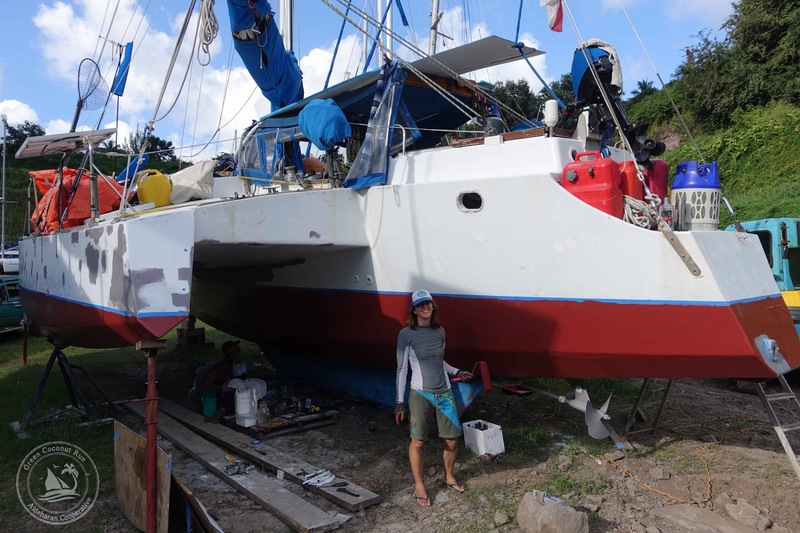 ‘trail angel’ of the Hiva Oa Boatyard. 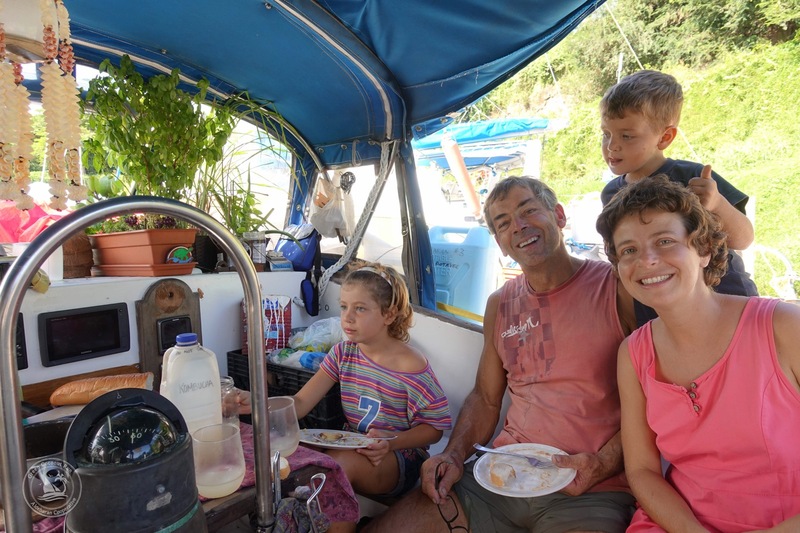 This sailor from the Azores (an island off Portugal) is cruising the world with his wife and two kids. 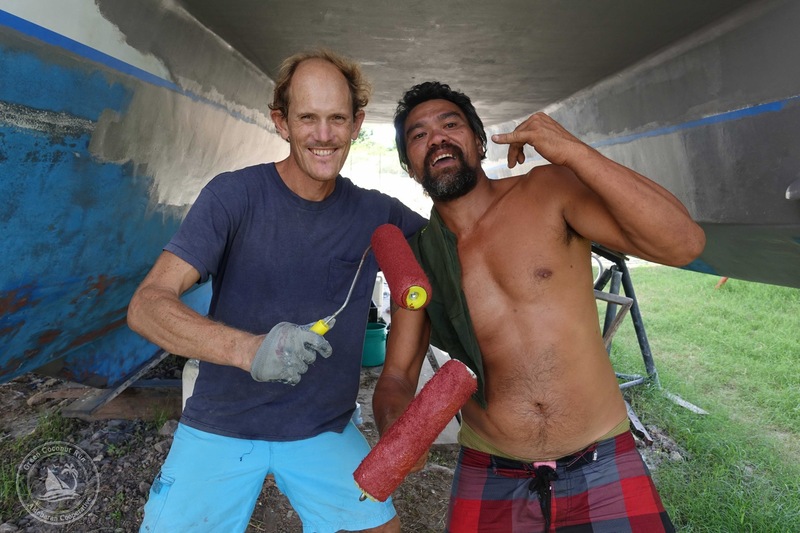 The impressive thing is that Armindo loves to fix boats; he works late into the night on his Lagoon catamaran, but during the day he spends hours helping out people around the boatyard. 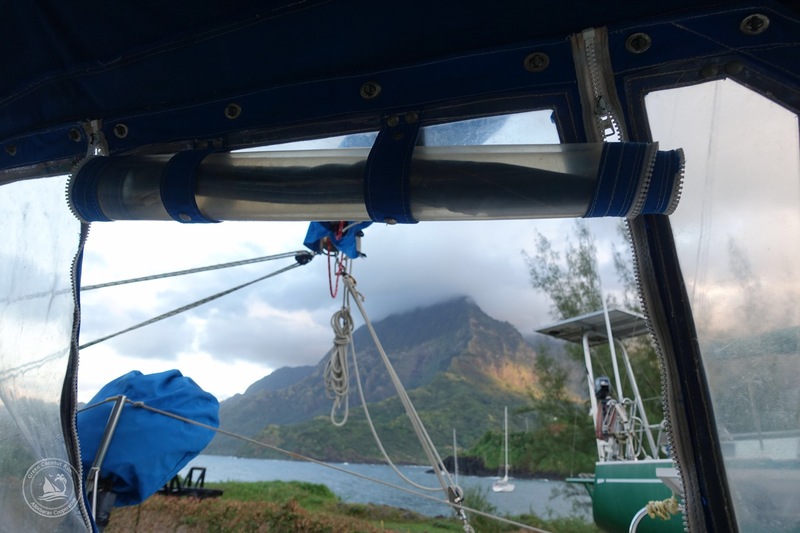 The most notable example was a crew of young Danish sailors (who we met in Galapagos, and had been stuck in the Hiva Oa boatyard for a month). 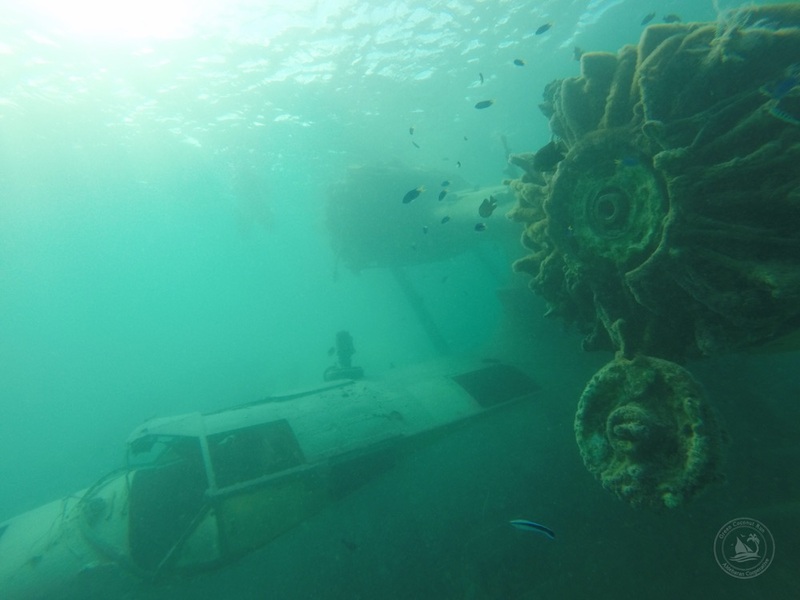 They were trying to build an entire new rudder, as their old rudder failed upon arrival in Marquesas (the stainless steel mount cracked, and the rudder was a bit rotten). 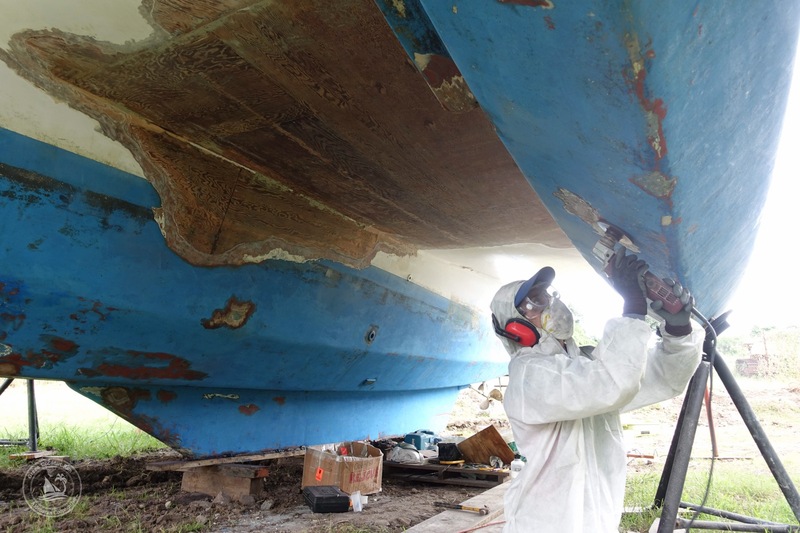 Unfortunately, there is only one competent fiberglass/boat builder in the island, so they might be waiting two months for the guy to do this job. 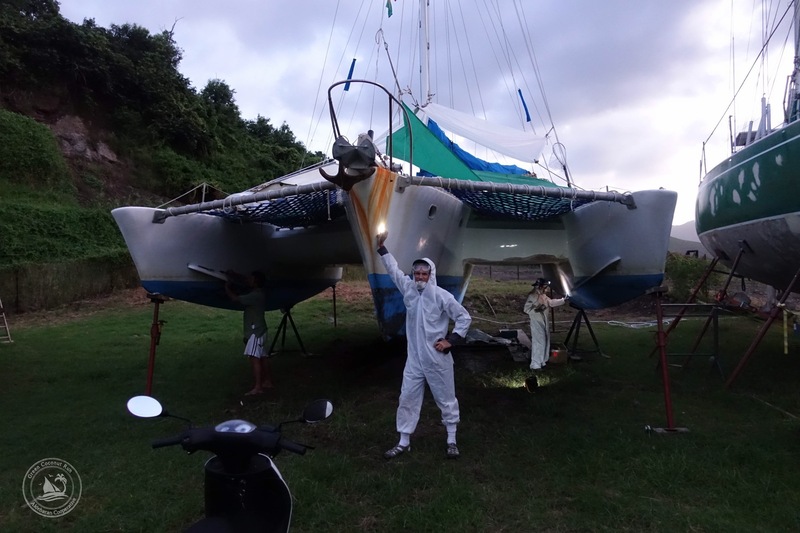 Armindo guided them through the entire process and the 24 year old Danes built themselves a new rudder within 10 days. It was incredible. The kind, high-energy Armindo took us under his wing. We told him about the vexing problem we were experiencing with the mysterious wet wood. He touched the wood with his finger and tasted it. “Salty!” he exclaimed. 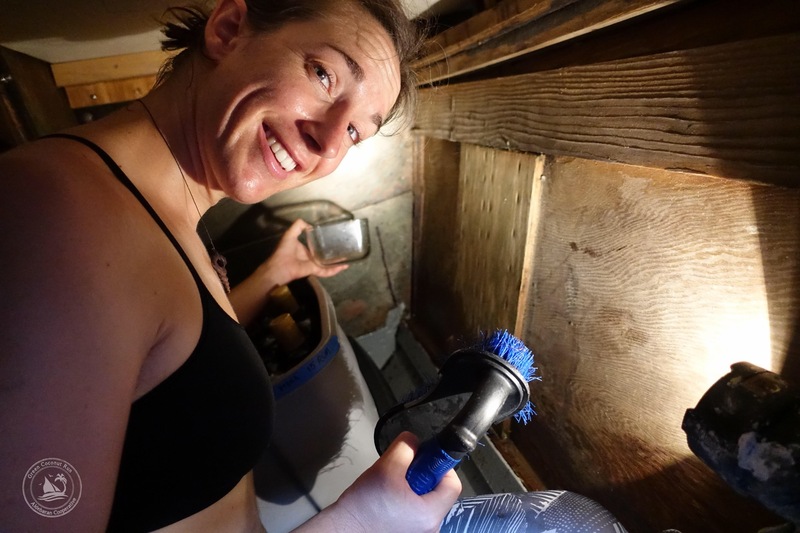 “You must wash this wood very well with fresh water, and I mean soak it, scrub it strong, then it will dry.” A counter-intuitive solution indeed: to dry it, you must first wet it. What was happening? The salt trapped in the wood was sucking moisture out of the air. 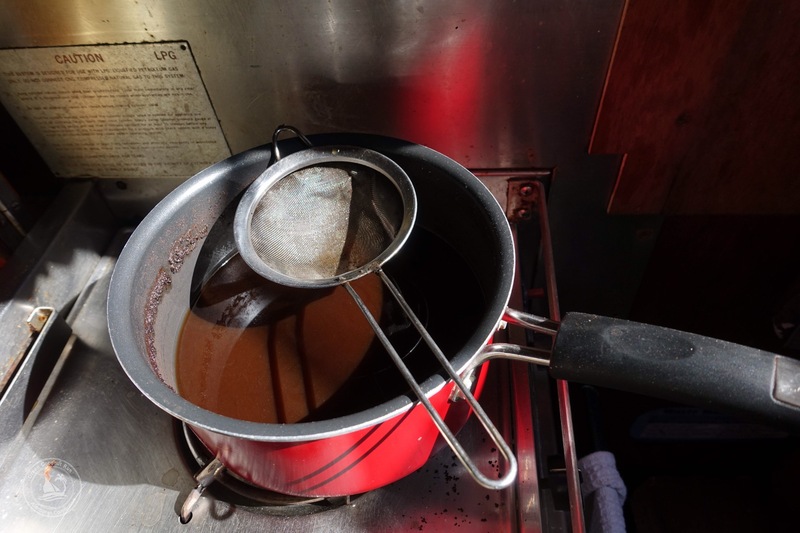 Every time the humidity would rise to a certain level, water was condensing in the wood. We recalled this was the area where our damaged fiberglass was 10 inches underwater, so all the ocean saltwater had permeated into the wood. We scrubbed the wood with fresh water from inside the ama and outside, and just as Armindo said, it dried out. 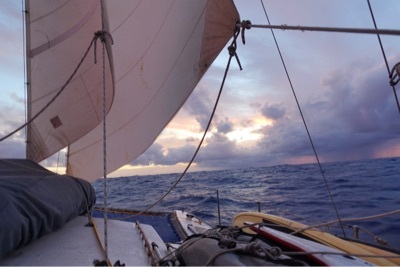 There are many young people “hitchhiking” on sailboats around the world via websites like “Find-a-Crew”. 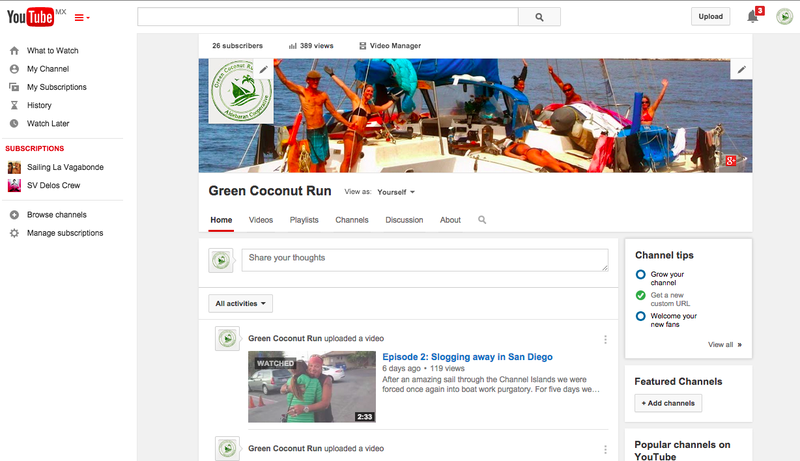 Boat owners post their trip, request crew, and pick who they like from all the responses they receive. Naturally, after a month or more at sea with strangers, almost all the hitchhikers were looking to jump their ships and find new boats! 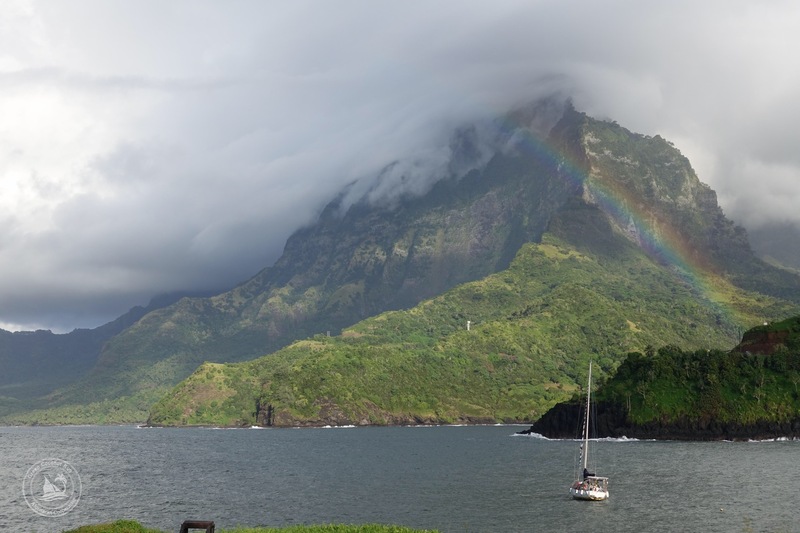 A massive shuffle was occurring in Hiva Oa: people swapping boats, all heading west to Tuamotos and Tahiti (hey, even Spencer managed to get a piece of that action). 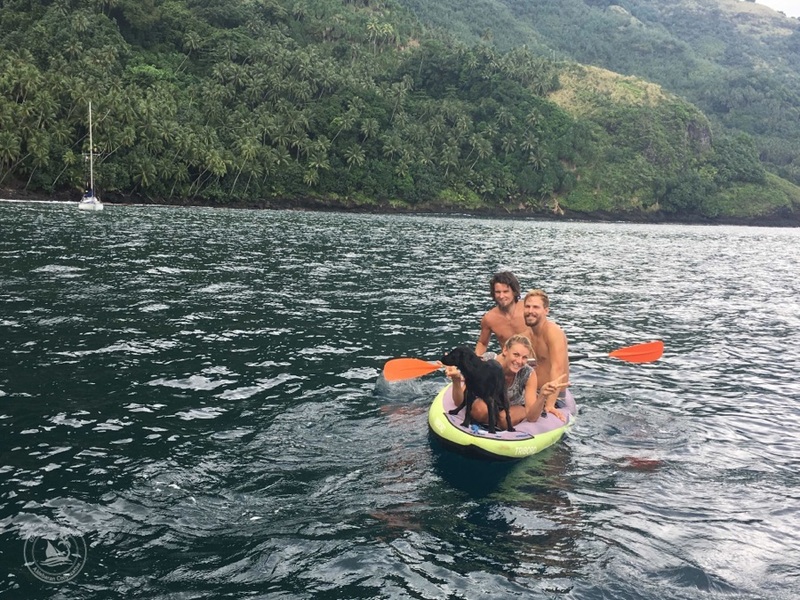 That is how we met Durant and Fabian, young German and French guys who were hitchhiking on different boats, and now were stuck in the boatyard waiting for their host boats to get re-launched and carry on the voyage. 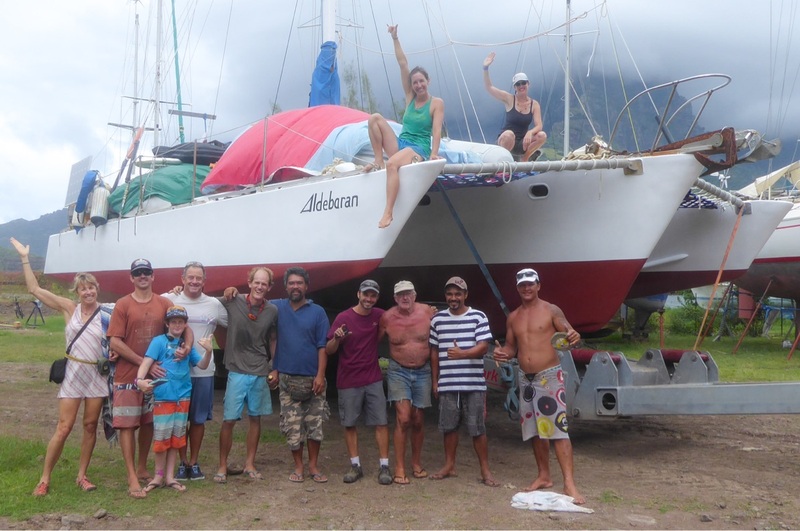 We offered these guys bottles of rum (our main exchange currency in the South Pacific… we purchased a few cases at $6/bottle in Ecuador, and traded for $30/bottle in French Polynesia) and they kindly spent hours sanding Aldebaran’s three hulls. Step 1. Once you’re done being in denial and experiencing existential panic, conclude that the soggy wood must be replaced, like it or not. Step 2. 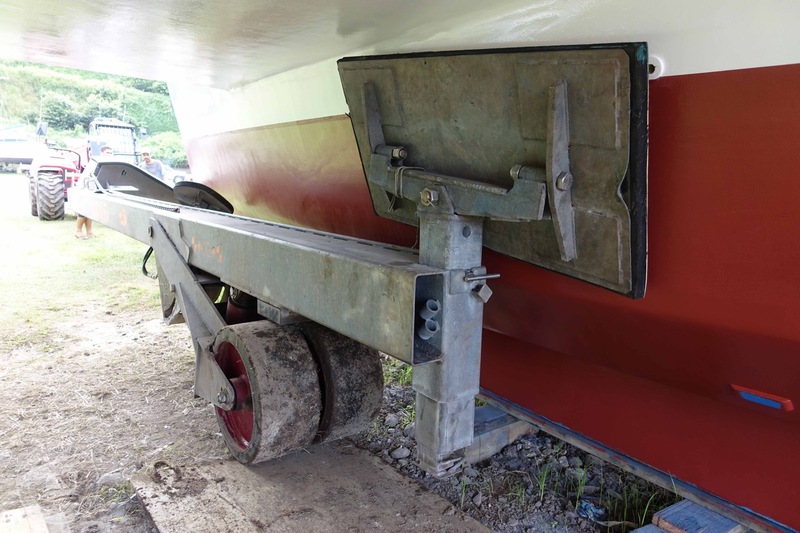 Stop being sad about your old boat giving you problems (every boat has problems) then mercilessly draw out a proper rectangle and take the saw to it. Step 3. 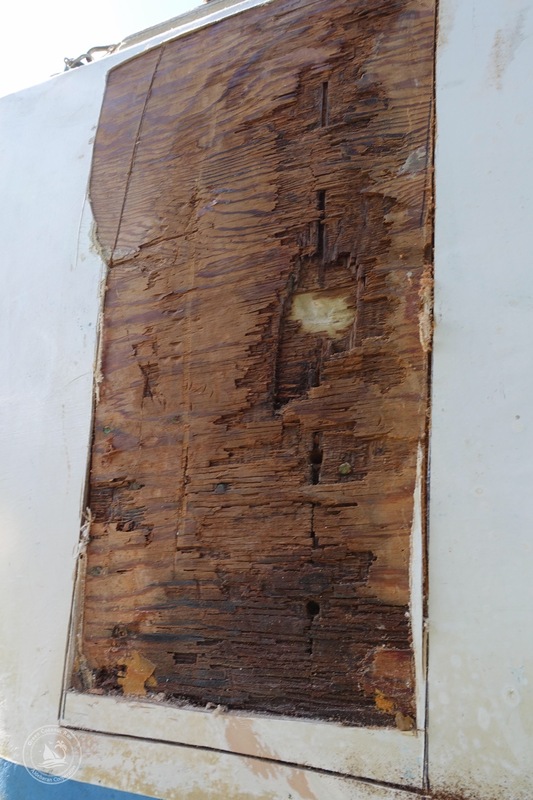 Screw new plywood into the cavity, then add filler for all the gaps, then fiberglass it– ideally not when it starts drizzling at sunset, if so, try to keep a tarp handy. Step 4. 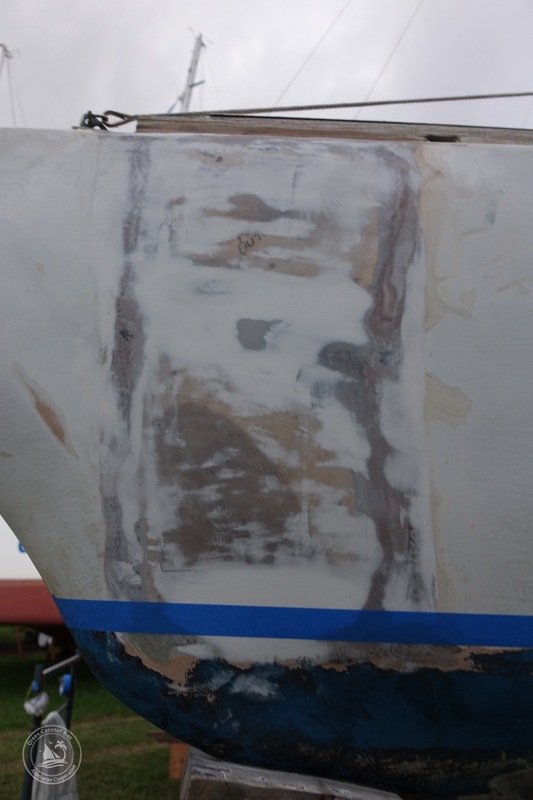 Realize you were a fool and fiberglassed too soon, and now the repair needs more wood to smooth out the curve, unless you want your boat to look like a muscle dystrophy victim. Step 4. Add more wood with yet more epoxy and and yet more screws, then once it cures take a grinder to sculpt it into a little more of a nice curve for the boat. Then fiberglass again, cause you blew it on the first time. This job required a Skill-saw to cut away a big panel in the side of the boat that we jokingly called our “new window”. The process of re-building the giant hole took lots of plywood and epoxy over the course of a week. After I was done with the initial wood installation, the repair area resembled a severe case of muscle dystrophy. It looked awful. 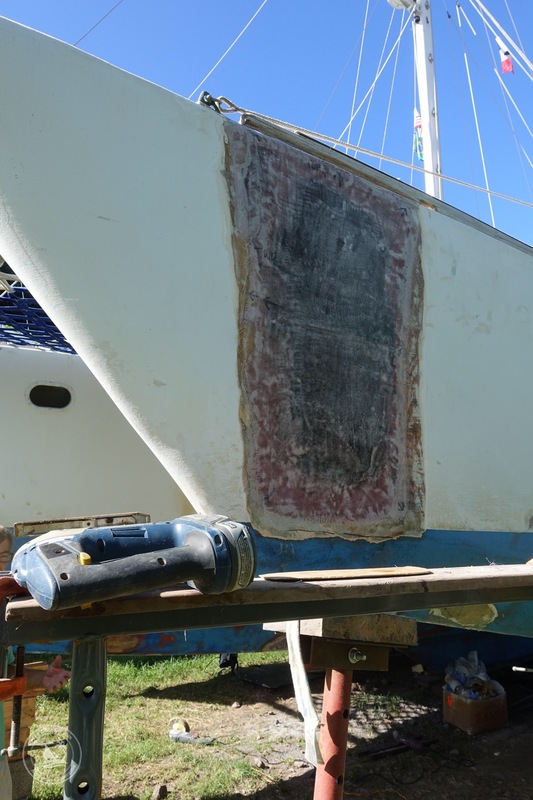 I found more wood to fill in the gaps and kept at it, sculpting wood and epoxy onto the side of the boat until it looked relatively smooth again. “Hump Day” is the other name for Wednesday, the mid-week energetic hump that you need to go over before finishing the work week. 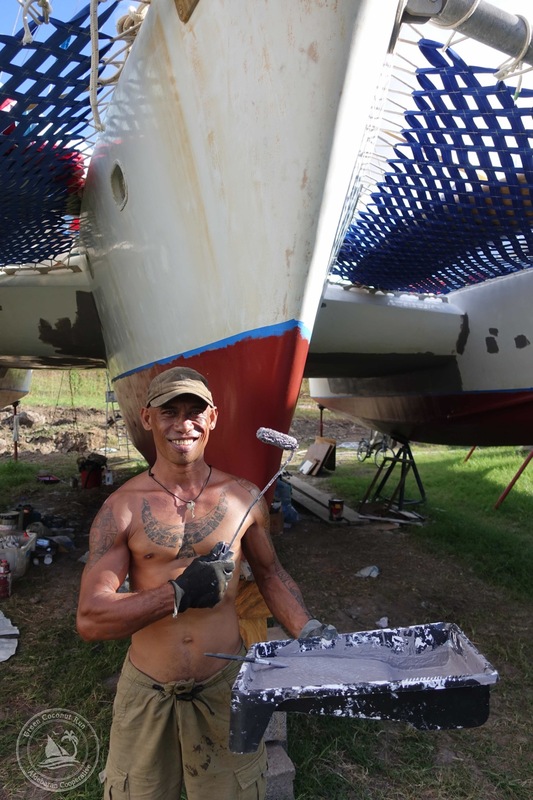 Every endeavor has a hump, a “test” shall we say, and for our 2 weeks at the boatyard, we struggled with the two Gremlins on Days 5-7, taking three steps forward and two steps back. Doubts and uncertainties grew as our massive repairs remained unsealed, exposed to the rains that threatened everyday. We became like bulldogs, refusing to let go and pushing, pushing, until our perseverance got us past the demoralizing energetic hump of the Gremlins…. battered but victorious, we got through it with time to fiberglass and seal the boat, in itself a job that was fairly beyond our heads. Purgatory: (n) a condition of temporary suffering; in Catholic doctrine, a place to purify your sins before going to heaven. Heaven is a sailboat anchored in a beautiful cove. Hell is a sailboat blown into the rocks. 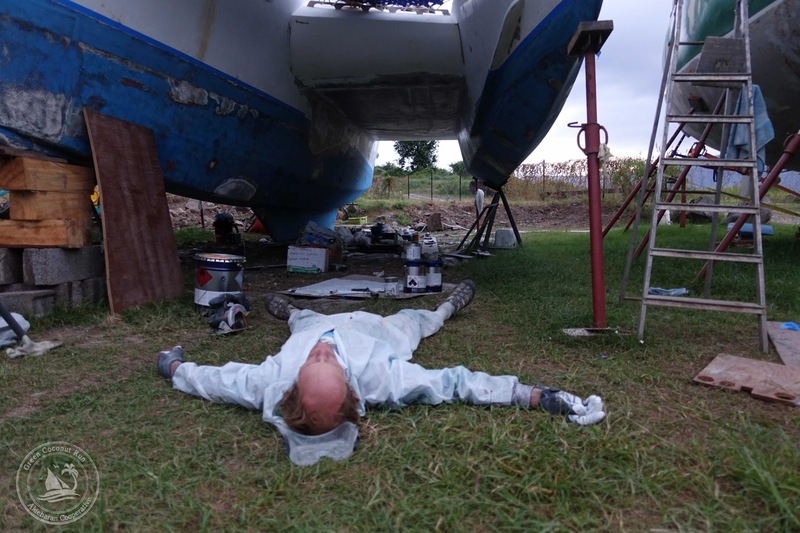 Then there’s purgatory– which is a sailboat undergoing repairs in the boatyard. 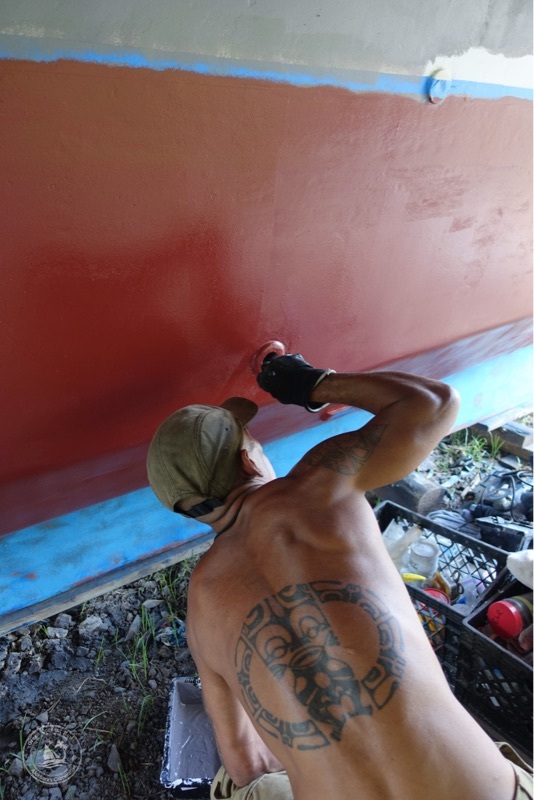 We began our first day of purgatory at the Hiva Oa boatyard on June 29, southern Marquesas, chiseling away the delaminated fiberglass under Aldebaran, and ripping away great chunks of its protective skin. Wet areas on the wood were now exposed for drying, which we hoped would take three days or less – if the sun was shining. Then we pulled out the heavy machinery: 5 inch and 7 inch grinders. The grinders are used to smooth out the fiberglass edges so that new layers have a smooth area for attachment. At the very least, the view was inspiring. When it was time to rest the exhausted arms from the heavy machinery, held overhead to sand the roof of the trimaran’s wing, and get a breath of fresh air outside the sweaty face mask, at least we could gaze at an astounding mountain peak that split thick clouds rolling by in dramatic formations. Aldebaran was no longer a boat, but a construction zone, albeit in a scenic spot. Would we have problems finishing the repairs? 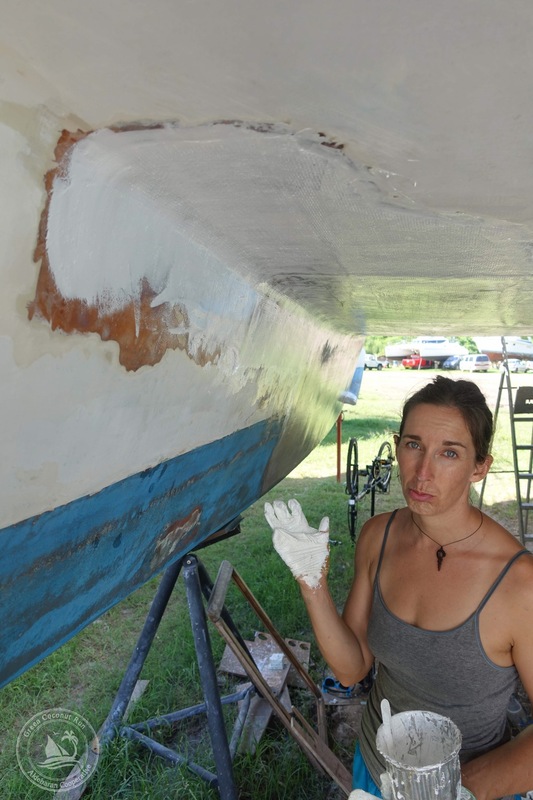 Would we run out of epoxy resin; would torrential rains prevent us from fiberglassing; would we get stuck here, like so many others in the boatyard reported (due to insufficient expertise, tools, or materials)?? The stressful uncertainty hung over us like a dark cloud… and so we embraced the 14 hour workdays with a necessary vengeance, if we were to finish the job in the allocated two weeks. P.S. Update… Since we have some wi-fi access at present, we were able to upload more photos for the “Famous Big Tikis” and “Hello Haul Out” posts… check them out and enjoy! (We’re normally only able to upload one photo per post with our satellite internet). 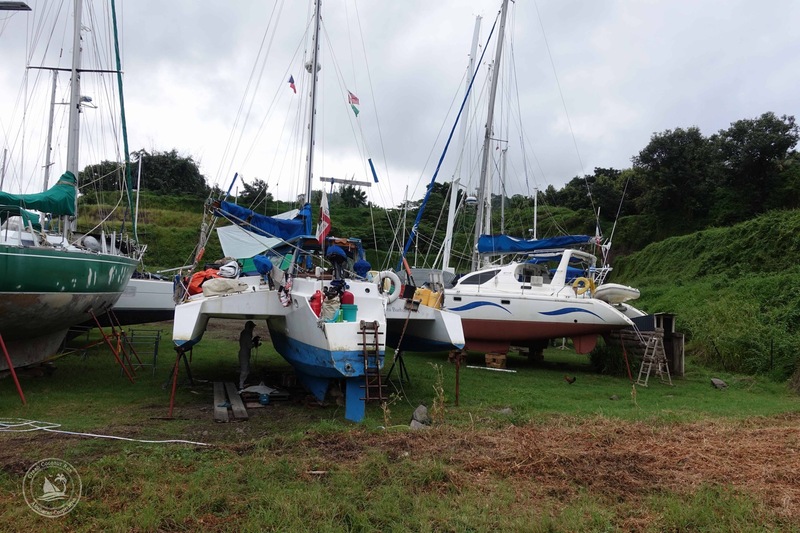 Would the boatyard in Hiva Oa would be able to haul us out of the water? This was the burning question, in order to fix the damage to our fiberglass. If they couldn’t, we would need to careen on a beach in order to do a less-than-ideal “bandaid” repair. 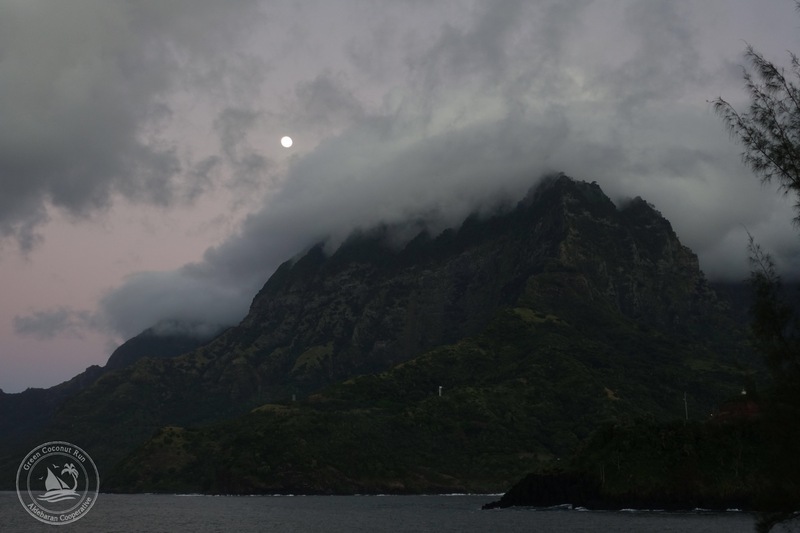 Finding such a calm bay in the swell-plagued Marquesas Islands is rather difficult. “Feels like it’s the battle trenches down there. Sounds like bombs going off. It’s gnarly! !” said Spencer, emerging from the cabin after a rough night. We were sailing Aldebaran into the wind, bashing our way North. 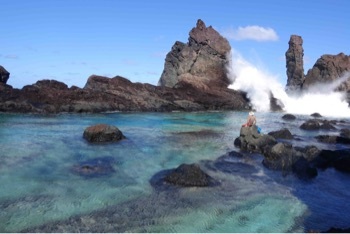 His colorful impressions were in fact a foreshadowing of the damage we discovered on the last day of our passage to Marquesas.